New ChansonUltra SoundUnder Counter Pre-FilterSystem Chanson Ultra Sound Alone The Chanson Well Water Ultra Triple Pre-Filter SystemThis configuration is for Stand Alone use for Water FiltrationComes Under Countermounting and a FaucetTheChanson Water® Triple Ultra Filter provides amazing filtering capabilities ofharmfulpathogens and bacteria, heavy metals, chemicals andcontaminantswithout removing beneficial minerals from the water. The Ultra has been configured to those whodraw water from a well.The Chanson Water® Ultra-filter has .01 micron strands that trap and remove bacterialand viralcontaminants from the water supply. 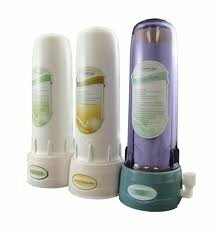 Because the smallest bacteriaknown to man are .02 micron, the Ultra-filter can claim removal of majoranti-bacterial properties.Filters with a .01 micron size are nothing new;they have been used and promoted as antibacterial filters for many years. Because the pore size is so small, a .01filter tends to get clogged. Chanson Ultra's unique design makes it thefirst "non-clogging" .01 Micron filtration system.With the Chanson Ultra Filter you get trueantibacterial protection which includesVirusesMold andFungusSporesE-coliand Coli form bacteriaGiardiaand Crytosporium99.9% ofall pathogensFFilter Cartridge ConfigurationSSTAGE 1: Ultra Filter -Addresses Cryptosporidium, E.Coli, Giardia, Cysts, Viruses, Mold and Fungus,Spores, Coli form bacteria, and 99.9% of all pathogensSTAGE 2: GAC (Granulated Activated Carbon) - Addresses chlorine,bad taste and odor, herbicides, pesticides, SOCs (Synthetic Organic Compounds)and VOCs (Volatile Organic Compounds)S STAGE 3: KDF/GAC - Addressesheavy metals, bacteria, sulfur, pesticides and nitrates Filter Cartridge Replacement The Stage 1 UltraFilter will last 2-3 years before it needs to bereplaced. The stage 2 and 3 filters shouldbe replaced approximately every 12 months. The Ultra Filter pre-filtration unit is intended forwell water application. If you have city water, please see the Chanson C3 pre-filtration systemI Installation MethodU ULTRA_SAFAUCUnder Counter Ultra Installation- for under counter stand-alone usage (no water ionizers - comeswith faucetT The first filter with a life time warranty All Chanson ultra filters have full lifetimewarranty on the housings hoses and fittings. Should your filter housing, hosesor fittings ever become damaged for any reason just give us a call and we willmail replacements to you right away. This warranty is exclusively for the ultrafilter. Shipping DetailsI use several warehouses to ship orders out for me. They use UPS, USPS and fedEx.HealthyBowlsSeeds SproutersStainless Steel PotsWater DistillersJuicersAir PurifierGrain MillsPasta CookersVegetable SteamersAlkaline water IonizersFood DehydratorsHealth ProductsJuicer Blender ChopperFermenting PotsRibbonsCanningShaved Ice AccessoriesEmergency PreparednessMeat Grinder Sausage StufferPopcornKitchenReverse Osmosis Water SystemPureProFilters CartridgesFloJet Water Dispensers.